Cancer is a disease that requires extensive life-saving treatment, and Robert Goodman knows that more than anything else. 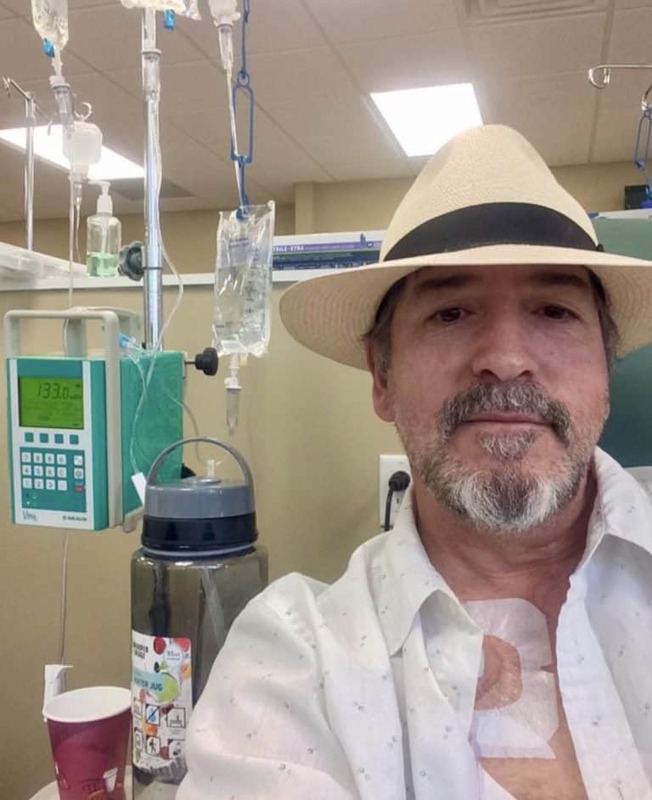 He had spent a long time undergoing a mixture of surgery and chemotherapy for his stage 3 colon cancer, and he needed even more recovery time. Robert works as a teacher at Palm Beach Gardens High School, South Florida, and he needed to take a 12-week leave of absence in order to go through his treatment and subsequent recovery. But when he looked into it, he was short of 20 sick days and therefore couldn’t qualify for this leave from the school district. Robert wasn’t sure what to do, so he decided to take a chance and put up a post on social media. He was a little uneasy about asking for help this way, but if he didn’t get the sick days required, he would have to go back to work on the 6th of August and would not be able to apply for the leave he needed. 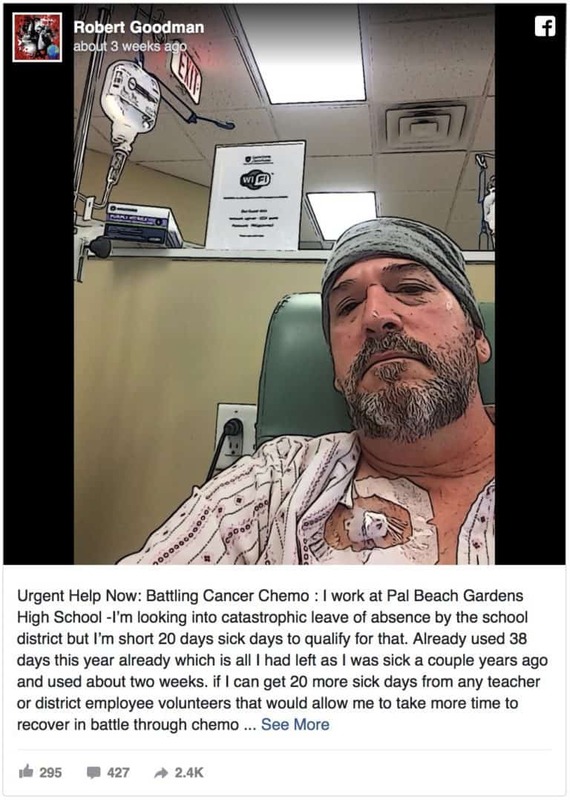 Alongside a selfie that he took in his hospital room, Robert posted the call for other teachers, asking if there were any who would be willing to transfer some of their own sick days to him. He explained that he’d already used all of the 38 days he had left this year – the remainder from when he’d been sick a few years back and used up two weeks – and needed 20 more so he could recover after a 12-week battle through chemotherapy. He ended his post by telling them who they could email to donate their sick days to, and thanked everyone for providing him with support should they choose to help him out. He wasn’t sure if anyone would be willing, but then he was overwhelmed by support and compassion from colleagues all around Palm Beach County! Within four days, Robert had more than enough sick days to take his time off to recover! It wasn’t just teachers who helped, either – lunchroom staff, classroom assistants, administrative staff, and all types of faculty members in the county came together in an outpouring of love and kindness. Robert ended up with a spare 75 sick days collected in total, and he was so grateful – but surprisingly, not particularly shocked by the compassion of his colleagues. Robert said that he was shocked at how quickly it happened, but he’d seen how teachers were always happy to give and help others. He himself had been a part of and witnessed the assistance provided to other teachers in the past, and he was happy that, for him, they stepped up, too. Robert posted another picture with a new post shortly after to thank everyone for their sick days and even just for their kind, encouraging words. In fact, he revealed that Channel 5 contacted him to run a story all about the incredible love and compassion that he’d been given. It’s truly amazing and touching to see people banding together for a good cause, to provide for someone in need!